You may be the man. If you can qualify, you’ll work as a special representative of IBM’s Applied Science Division, as a top-level consultant to scientists, business executives and government officials on the application of Electronic Data Processing Machines. It is an exciting position, crammed with interest, and responsibility. Employment assignment can probably be made in almost any major U. S. city you choose. Excellent working conditions and employee-benefit program. For applicants with the same basic qualifications, opportunities are available to teach in this exciting, new field. 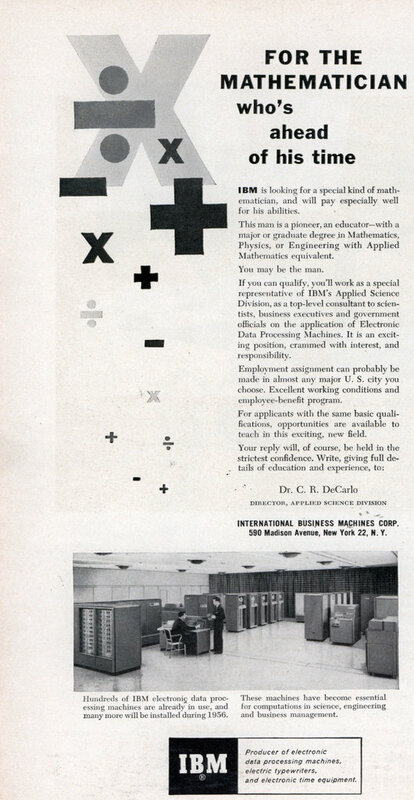 INTERNATIONAL BUSINESS MACHINES CORP. 590 Madison Avenue, New York 22, N. Y. Producer of electronic data processing machines, electric typewriters, and electronic time equipment.